I spent hours creating a fantastic iMovie with video and photo footage of the cruise. 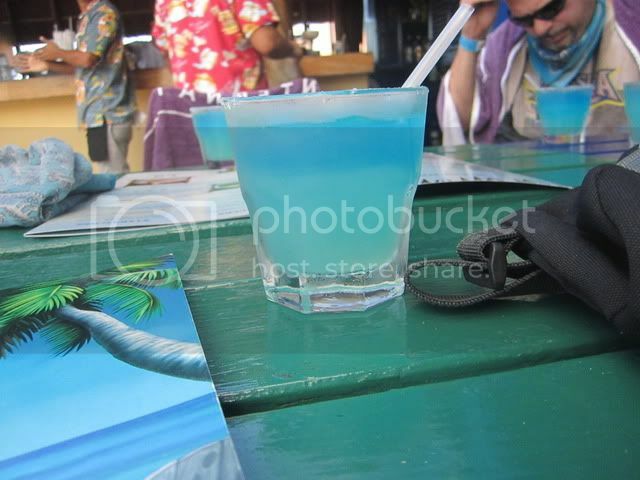 I included some Christmas songs from the band Reliant K, Margaritaville (for the photos of us there), Good Feeling by Flo Rider during our X Rails excursion, and Michael Franti's Say Hey (I Love You) for Labadee and Jamaica video & photos. It took nearly 2 hours to upload on to YouTube. I was so excited to debut this video.... YouTube axed it for copyright reasons. However they wouldn't tell me which songs were on the "no-no" list. So I basically resorted to just the Reliant K songs because YouTube allows them. So for your viewing pleasure, here is the "not as great as the original" video review! I liked the Ice Show better on Oasis. As I said before the Allure Ice Show was a let down to me. I preferred Oasis's 2nd show, Come Fly With Me to the Allure's Blue Planet. I felt that Blue Planet was strange. Again not for lack of talent, but I just couldn't get in to the show. Some parts were great though. Come Fly With Me held my interest more because I was a tap & ballet dancer for 16 years and there was some tapping in that show along with acrobatics & aerial stuff. I saw Hairspray on Oasis and chose not to see Chicago on Allure. I just didn't want to be in a show for 2 hours and my husband really hates Broadway type shows. I loved OceanAria (Allure) equally as much as Oasis of Dreams (Oasis). These are both Aqua Theater shows. We had Ken Rush as our CD on both Oasis & Allure. We saw him around more on Oasis, but I think because the Allure was a holiday sailing he had more events to run around to. I know people complain about him, but I don't let a CD make or break my trip and he wasn't annoying like some CDs can be. He does talk VERY FAST though. I found the decor of the ships to be equally as fun and beautiful. The Oasis had a much better handle on the Dining Room issues. It may have been because of the holidays that we ran into the seating issue on Allure. 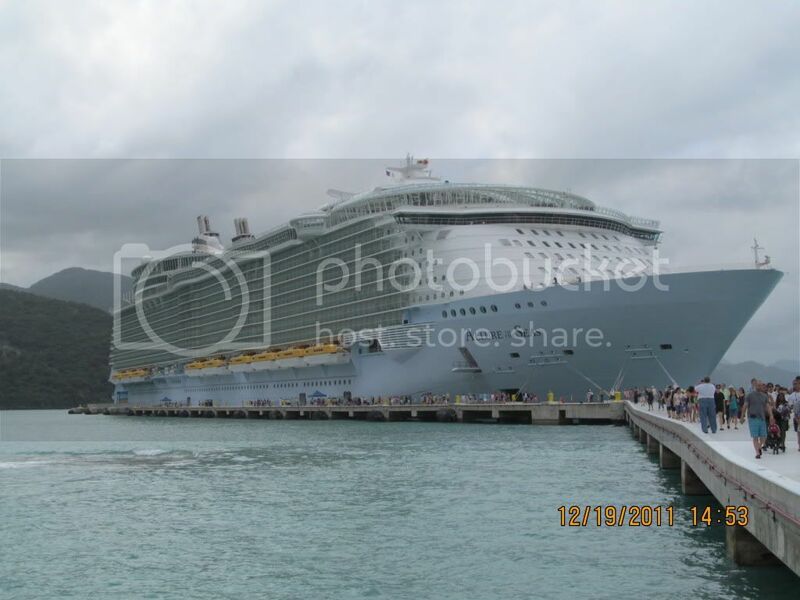 We took the same itinerary on both ships (except we stopped at Costa Maya on Oasis and Falmouth on Allure because Falmouth wasn't completed at the time we sailed on Oasis.) I can't complain about any port on either trip. We did spend more time on the ship with Oasis. Room Location: On Oasis last year we had cabin 8553 which was forward, first inside cabin from the stairs. It was convenient and we loved being near Central Park. This year on Allure we ended up with a balcony cabin on deck 7, a very short walk from the stairs. 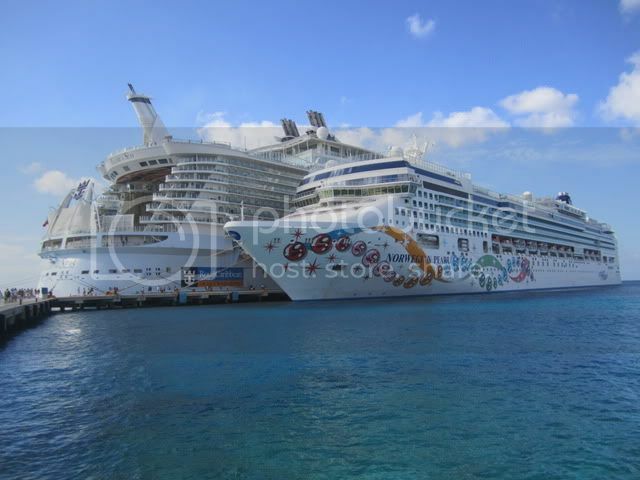 When I choose to go on Oasis or Allure again I would prefer to be closer the the AFT stairwell around 7th/8th deck. It was very convenient. Matt and I only take the stairs on cruises (helps combat the eating) and we found that this was the best location for us. Boardwalk: I like the Allure's Boardwalk MUCH better. 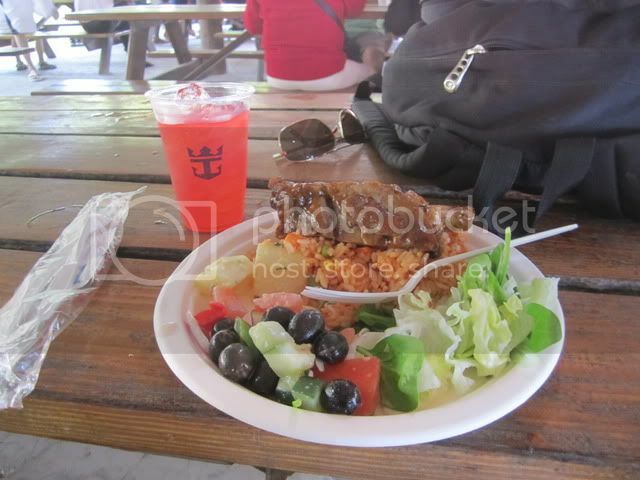 I don't eat much seafood, so Seafood Shack was a waste to me on Oasis. I enjoyed doing the Fiesta at Rita's on Allure. I also really liked the Boardwalk Doghouse. I had a few over the course of the week. On Oasis we went strictly for the ship. We only got off the ship to stretch our legs, but didn't do anything. Enjoyed exploring the ship while the masses were out for the day. We loved it. 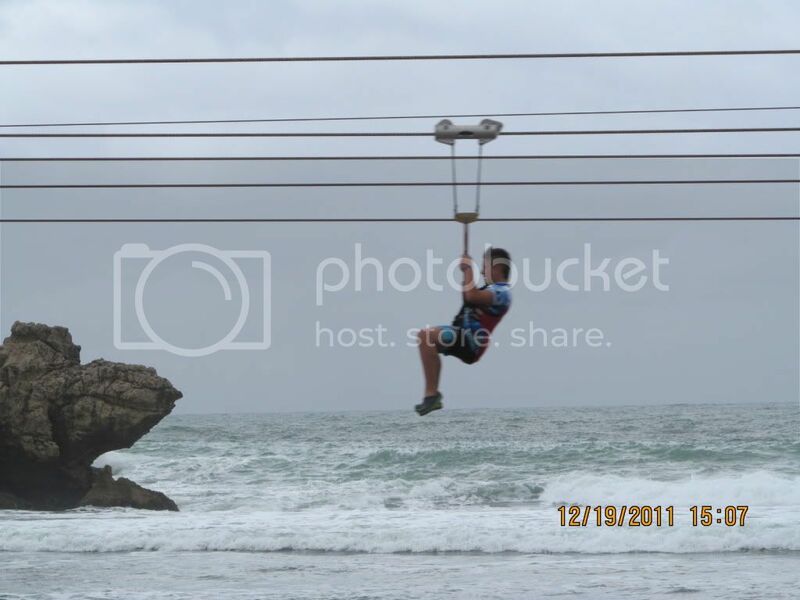 Especially the FlowRiders, we were able to use them with minimal lines. Think: 5 people. 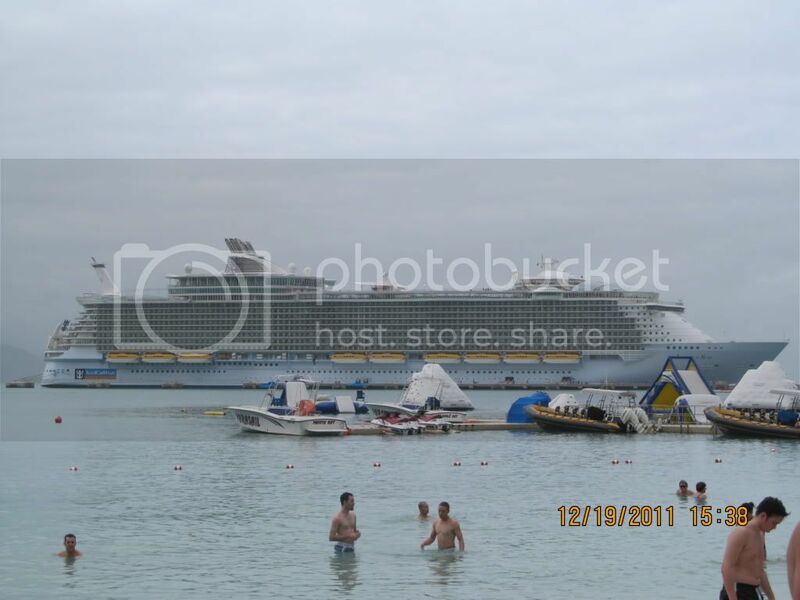 The main reason we booked this particular cruise was because it was a holiday cruise. 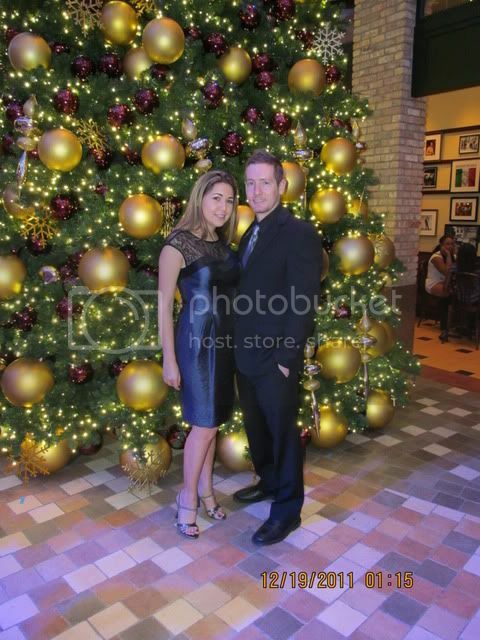 We arrived back on Christmas Day, so the ship did all the Christmas activities Xmas Eve. For many people, Xmas Eve is the day they do presents and dinner. “Santa” agreed to come early so the kids could get their gifts. Each child got a blue RCI blanket. The holiday dinner was served on Christmas Eve. Same exact menu as last year. 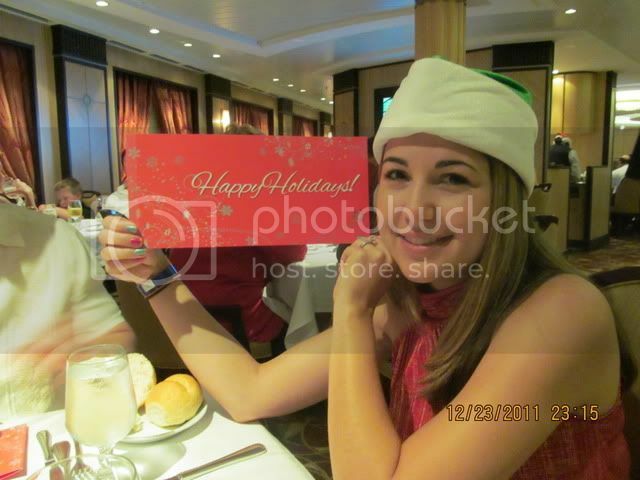 They would not let us keep the menu because they needed them for the next sailing which was also a holiday cruise. My mom got one anyway! 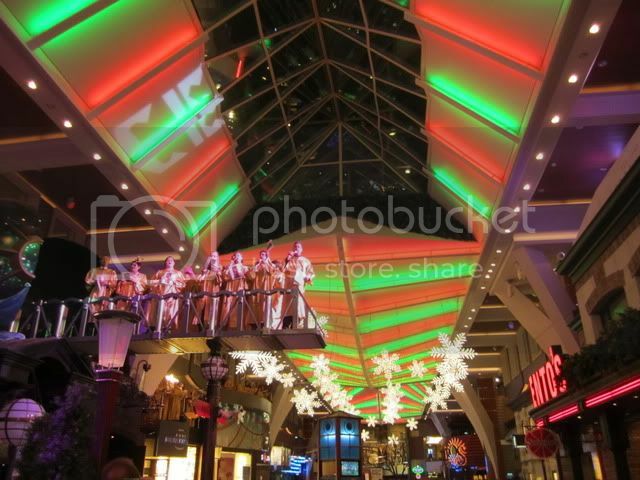 At 10:30 on Xmas Eve there was caroling in the Promenade with snow! 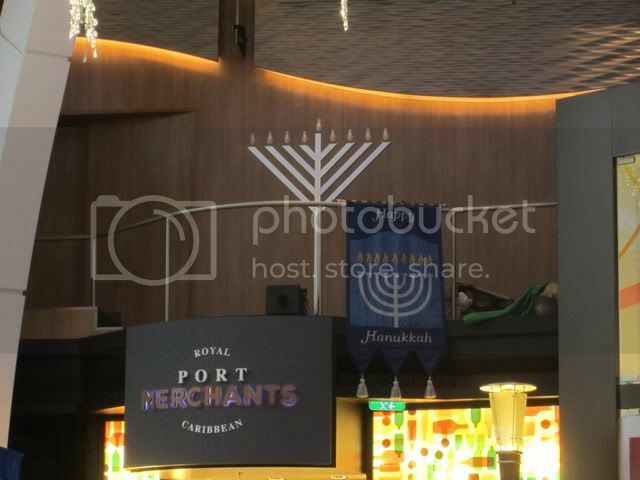 Hanukkah service was held in the Windjammer each night starting on the 20th. There were far more people than they had expected for the service. We only went on the first night. My mom and I were off exploring and were supposed to meet my husband and her boyfriend in the WJ. My mom and I celebrate Christmas, my husband and her boyfriend are Jewish. My mom and I showed up and the boys were nowhere to be found. So much for the holiday festivities that night! 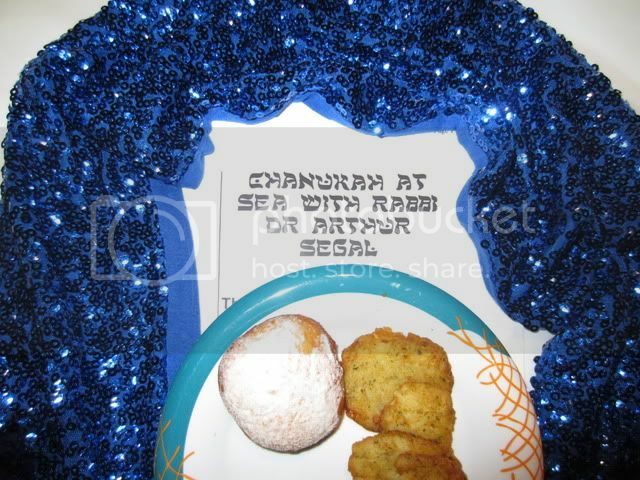 The latkes were yummy! 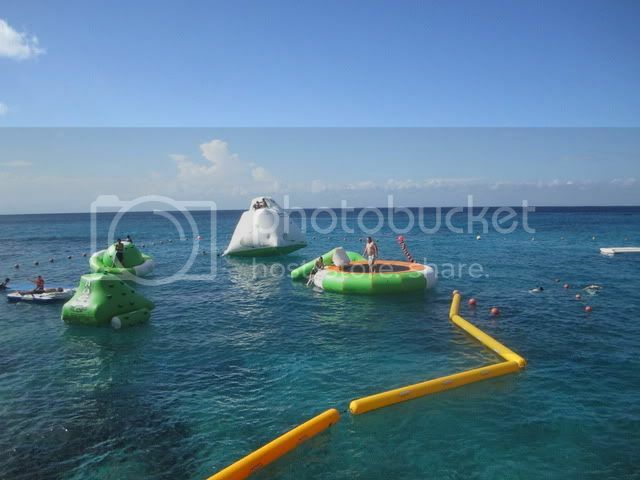 Cozumel has a variety of great excursions. I’d say this port has so many things that you could go there a couple hundred times and find something new. 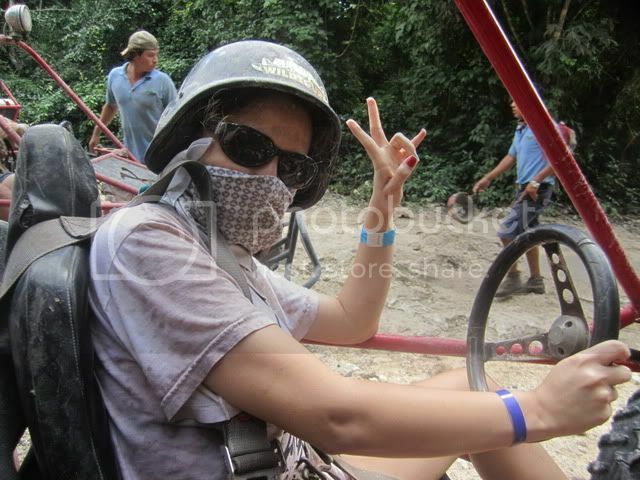 I’ve gone zip-lining, Segway Riding, Margarita & Salsa Dancing/Making, but this trip takes the cake. 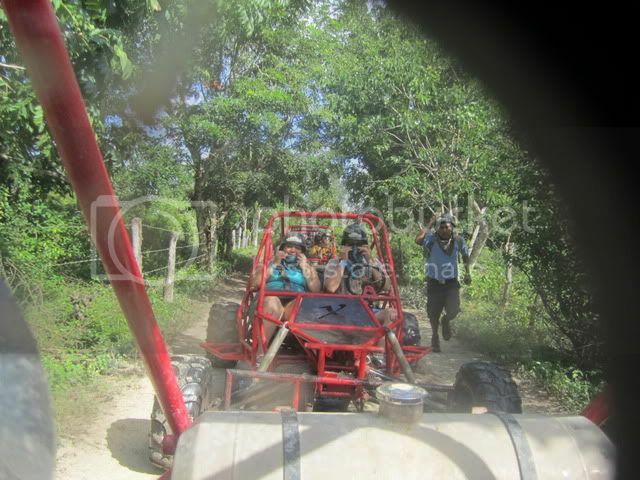 We booked the X Rails Off Roading & Jade Caverns excursion. I’m really proud of my mom for putting up with my choices. In the end she thanked me because she had a blast but would have never chosen, on her own, any of the things we did. 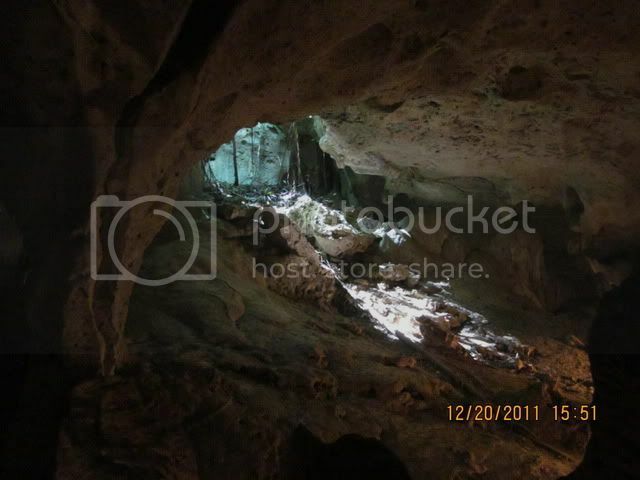 We drove the X Rails out to Jade Caverns for about 45 minutes. 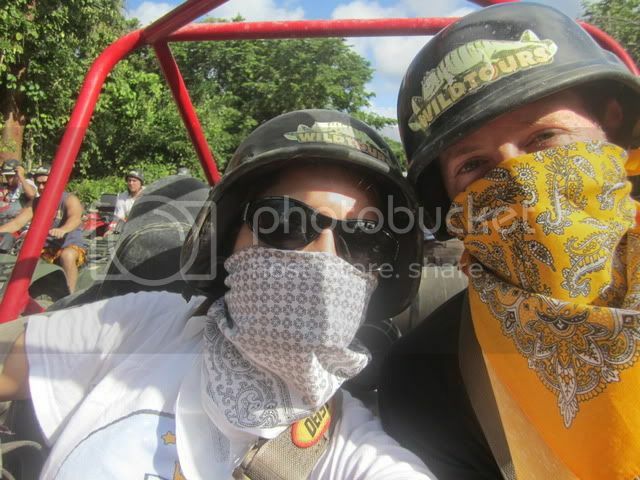 We got muddy, bumped around, etc. Lots of fun! 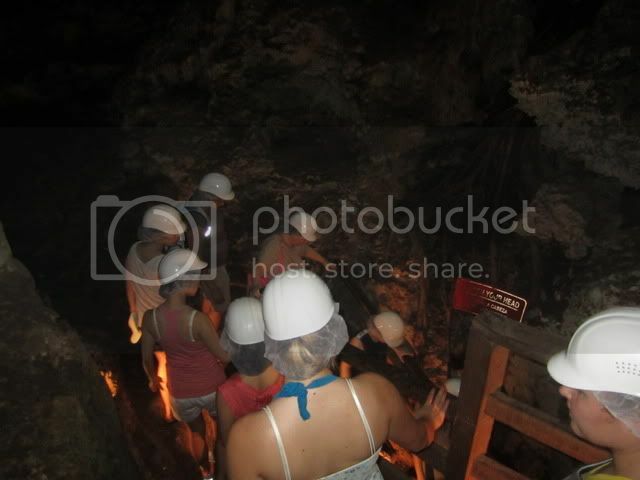 At the cavern (cenote actually) we swam in the water, then the guide took us through a small passageway that led to a bat cave. It was pitch black and everyone was yelling. Pretty scary. My husband swore something swam against his leg while we were in there and it wasn’t a person. 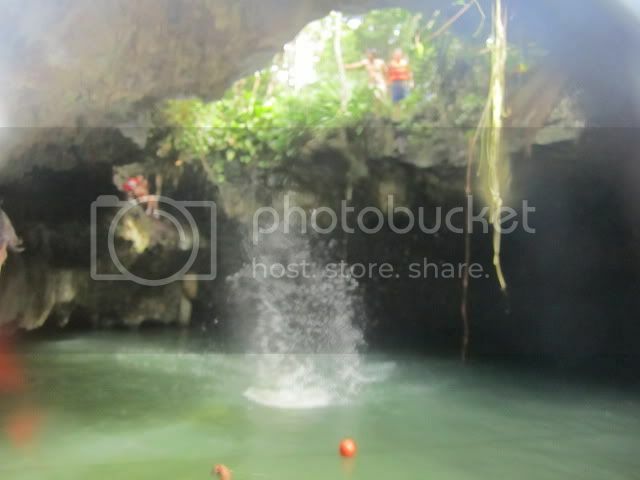 Right before we got back in the X Rails one of the guides took a few people to the top of the cave to jump in to the water. Matt jumped, not me! 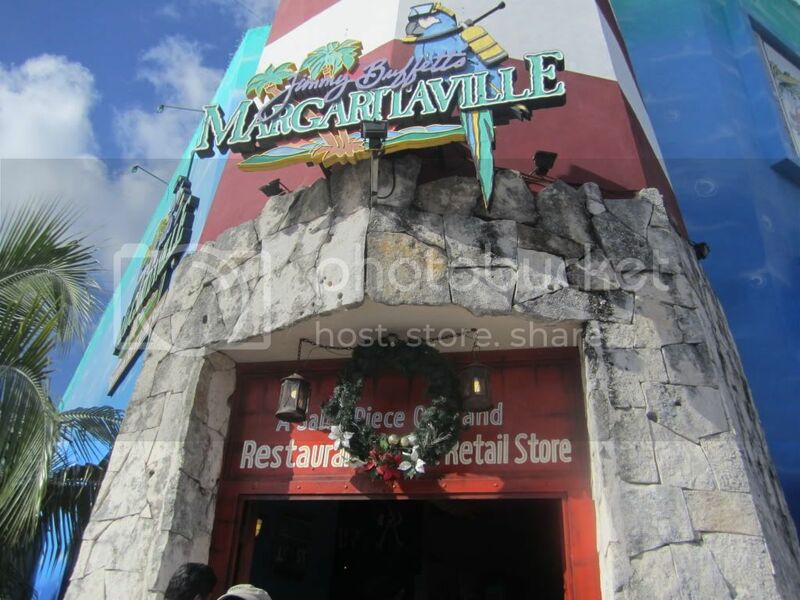 Because we booked with an outside vendor our excursion included a free drink at Margaritaville. 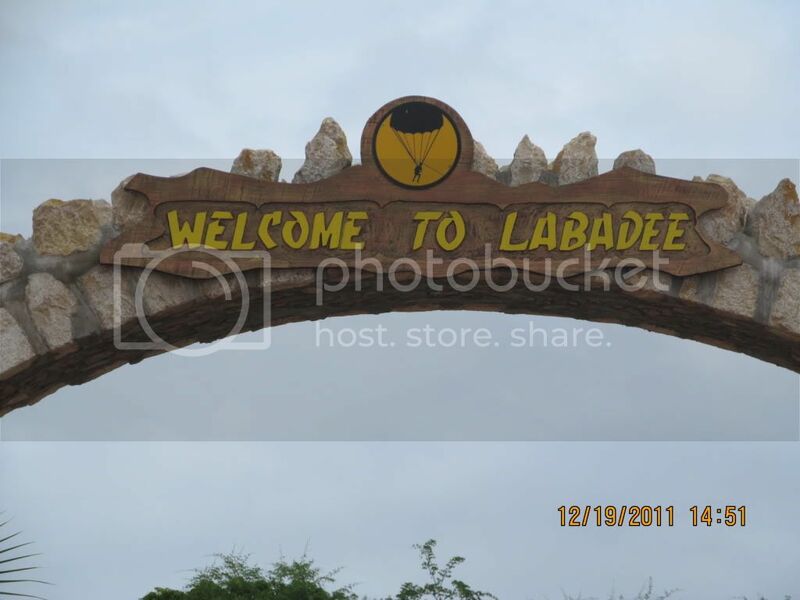 So they dropped us off there after the excursion. I loved it. 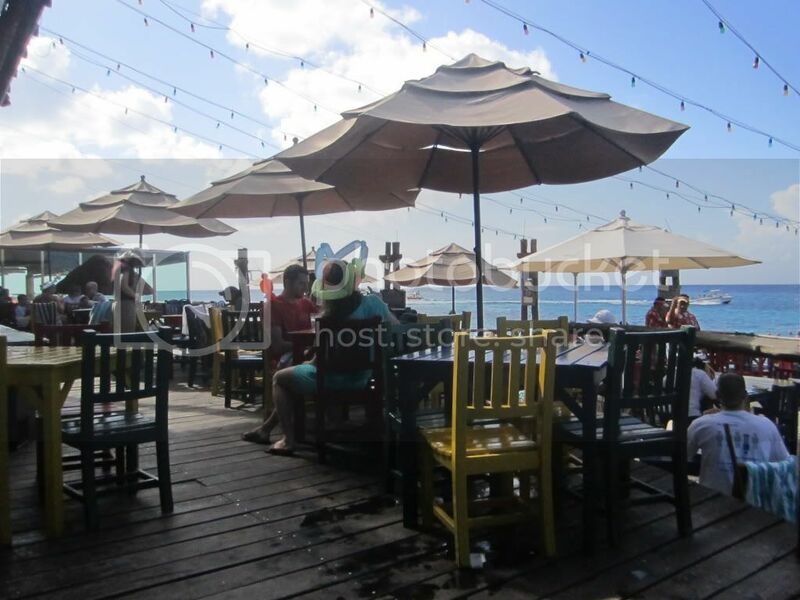 It looks like nothing from the outside, but they have a great deck out back and a swimming area with inflatable toys that you can use as long as you are purchasing food or drinks. The nachos and quesadillas were excellent! The free margarita was BEAUTIFUL! Next time I visit Cozumel I will definitely make an effort to come back here. Falmouth, as I stated before looked great to me. 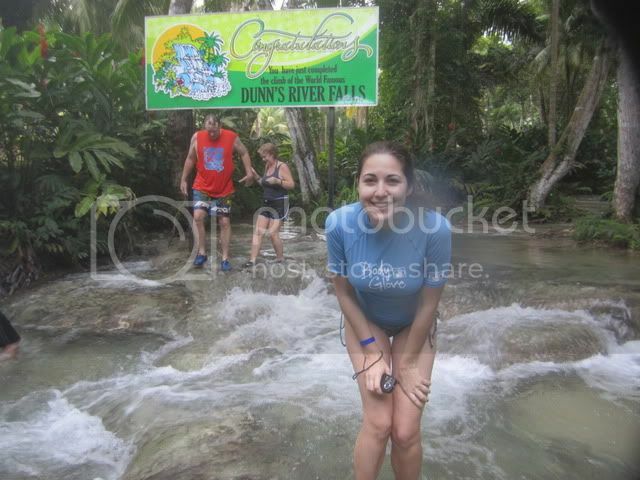 We chose to do the Green Grotto Caves & Dunn’s River Falls excursion. Mostly because it was cheaper than the Dunn’s River Express. Not sure why, but whatever! They have since changed the prices. Maybe they caught that error. We paid $54 pp for GG&DRF. It’s now $2 more than Dunn’s River Express- at $69pp. It was a nice surprise. 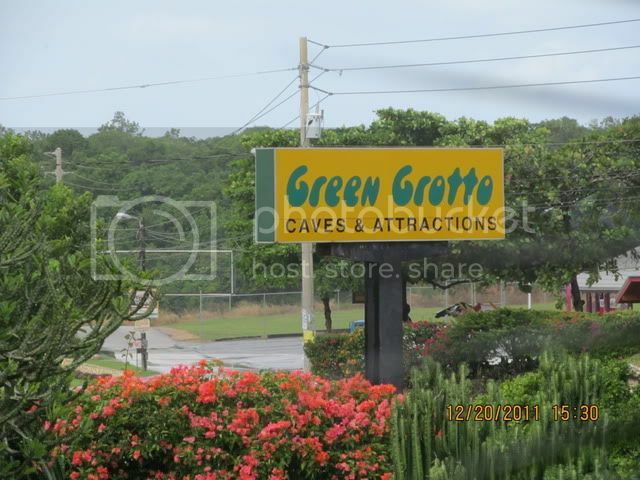 The Green Grotto Caves were interesting, we had a very funny guide, and I learned while I was there. 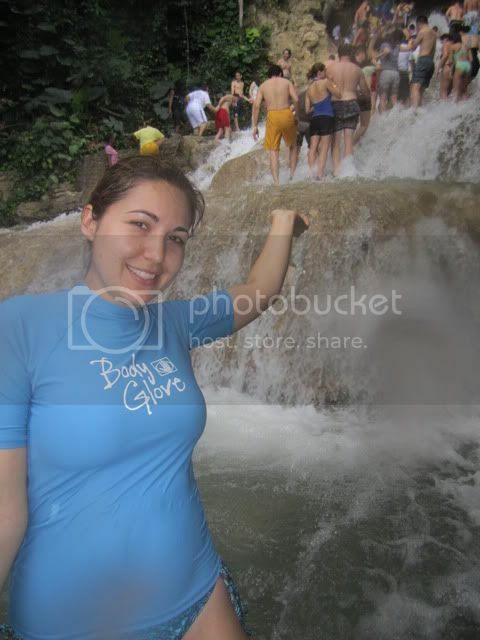 Next we went to Dunn’s River Falls. 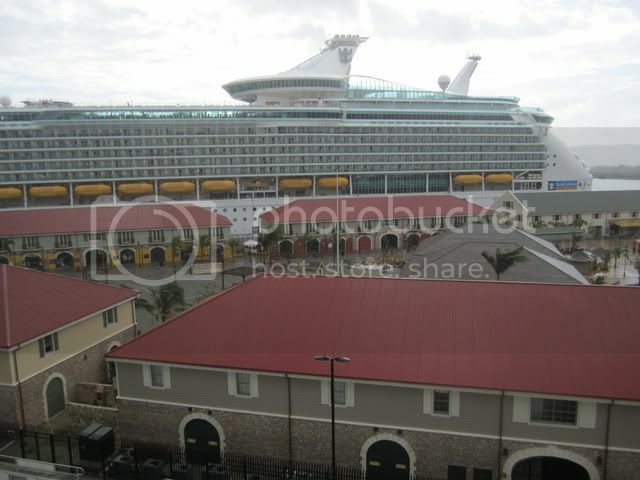 Amazingly, on 12 previous cruises none of the stopped in Jamaica. So this was my first chance to go to DRF. I love it. We had a blast. 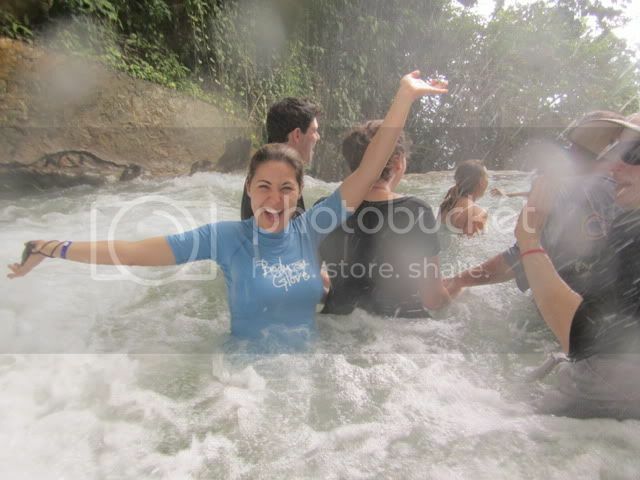 The water was frrrrreezing! I think I numbed up to it after a few minutes because it didn’t bother me when we were climbing. Our guide from the bus told us exactly what to do to avoid the tricksters that try to get you to buy their stuff. 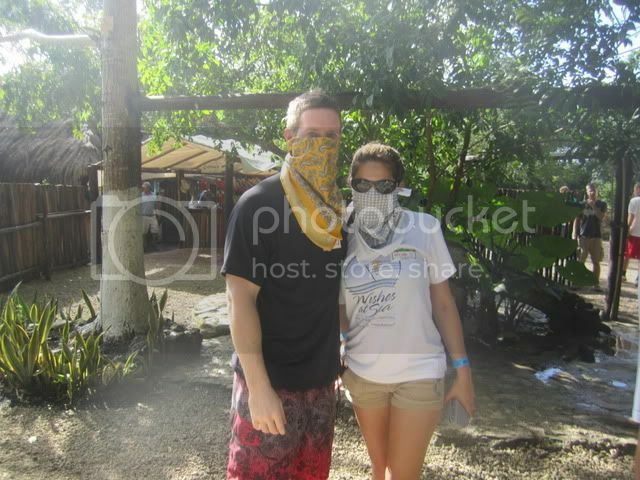 We had no problems with anyone bothering us in Jamaica. I know people have said that the people can be pushy but everyone was happy, friendly, and not pushy in any way!